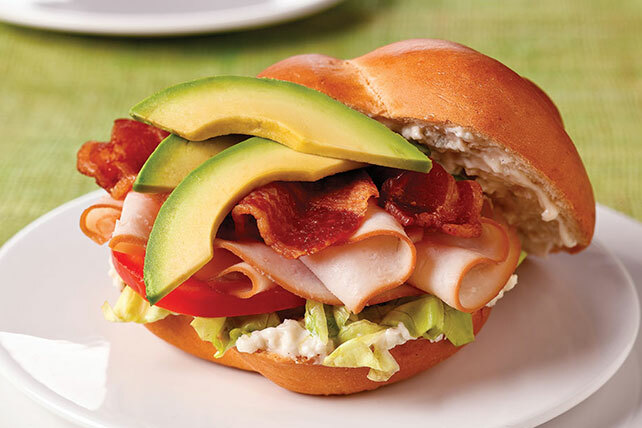 If you like Cobb salads, you'll like this yummy toteable sandwich version. Sweet honey smoked turkey breast blends perfectly with savory blue cheese. Mix dressing and cheese; spread onto cut sides of roll. Serve with assorted cut-up fresh vegetables and a piece of your favorite fresh fruit. Prepare as directed, omitting the blue cheese, substituting KRAFT Lite Ranch Dressing for the MIRACLE WHIP and adding a KRAFT Slim Cut Swiss Cheese Cheese Slice to the sandwich filling. Substitute KRAFT Real Mayo Mayonnaise for the MIRACLE WHIP.